One of the most impressive and addictive titles released at the Gamecube's launch was LucasArts' Rogue Squadron II: Rogue Leader. 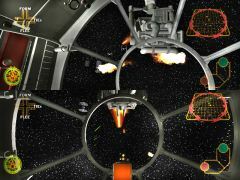 With visceral arcade action and amazing graphics, the game put players right into Luke Skywalker's cockpit. 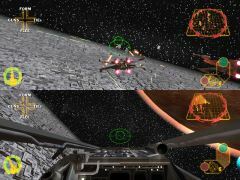 Now, the third Rogue Squadron title is on the horizon, Rebel Strike. While there will be more flying missions, players can now jump out of their ships and take an active role on the ground. Additionally, Rebel Strike will include extensive multiplayer support, improved graphics and more extensive cinematic play. Join us as we once again enter the Star Wars universe and examine the sequel to the GCN's first killer app. Even though Star Wars hasn't always translated that well to the video game universe, there have been some notable exceptions. One of these was LucasArts and Factor 5's 2001 release Star Wars Rogue Squadron II: Rogue Leader for the Gamecube shone like a beacon to both science fiction and electronic game fans. This was an amazing follow-up to the first Rogue Squadron title on the N64. Not only was this a fun, action packed shooter, it sported amazingly smooth, mind-blowing graphics that set the bar pretty high for the console. Now, the long awaited third installment in the series is set for release this November with Rogue Squadron III: Rebel Strike. Once again, the game focuses on the events that unfolded during the classic movie trilogy. The new installment will allow players to relive some of the most-unforgettable sequences of those seminal films. While the first game emphasized aerial and space-borne combat, Rebel Strike expands the formula exponentially. The gameplay has been expanded dramatically with ground-based missions that allow players to get closer to the action. These ground missions will allow for more player development, as well as a richer plot that brings the classic trilogy to life. 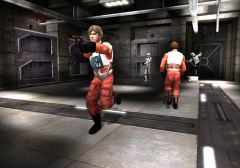 Playing as either Luke Skywalker or Wedge Antilles, the game lets you perform many of the famous maneuvers from the series. The new ability to get out of the vehicles will make a huge difference in how the game plays and feels. For example, in the original game, you disabled the Hoth Walkers by flying around them and tying a rope around their legs. Making things even more exciting, you'll even have the chance to pilot the AT-ST walkers this time. In Rebel Strike, however, this sequence has been expanded and Luke can now get out of his vehicle and do this by climbing up the walkers himself. This should definitely make the game much more immersive and make you feel like you're in the movies. 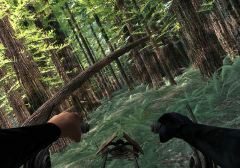 The original game allowed players to pilot several cool vehicles in flight, but in the new game, in addition to the X-Wings and B-Wings, you'll have the opportunity to race through the moon of Endor on the famous speeder bikes, reliving one of the most exciting sequences in Return of the Jedi. 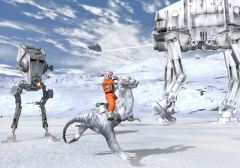 Players can also ride on the famous Tauntauns in Hoth and use other vechiles as well. This will definitely give Rebel Strike's gameplay more variety and depth, though there should be some satisfying shooting sequences, including the climactic attack on the second Death Star seen in ROTJ. 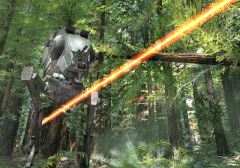 In another exciting sequence, you'll undertake an aerial player combat mission over the Yavin 4 forests. 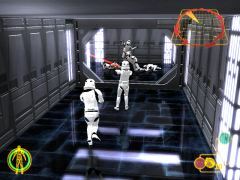 Once this mission is complete, you can land on the surface then battle Imperial Stormtroopers in an ground battle sequence. After defeating these Stormtrooper forces, players then return to their X-Wing to battle with wave after wave of the Empire's TIE fighters. These dogfights are promising to be quite intense, and as this example shows, the game's multipart missions have been expanded. This should better reflect the epic scale of the films and make the experience all the more immersive. One of the more intruiging aspects of Rebel Strike lies in its mission structure. RS will let you play through covert ground or air-based operations as one of several different characters. One of these will allow you to rescue Princess Leia from the Death Star, as seen in the first movie, though its unclear if the famous garbage compactor scene will be included. This will change the dynamic of the gameplay more than enough to make it feel like a completely new game, not another slapped-together sequel. Players will also be able to visit additional famous locations from the SW trilogy including the cloud city of Bespin, the tundra-plains of Hoth and asteroid strewn space areas. Factor 5 is promising to include more than a dozen unique missions in Rebel Strike, which should keep you playing for some time. Rebel Strike also includes a bevy of extras that can be accessed using its reward system. After defeating levels and mission, you can unlock numerous bonus features including extra missions, vehicles, and locations. This is very much like the reward system seen in the previous games, which should keep your motivation levels high throughout. In addition to these expected bonus features, there's another huge surprise in store for gamers who play the multiplayer modes. Rebel Strike will include multiplayer support, which will allow several players to compete simulteanously via a split screen mode. There will be several multiplayer modes included in Rebel Strike including co-operative modes, endurance matches, challenging one-on-one dogfights, and even a base capture mode. While the GCN lacks significant online support, these modes sound quite exciting and should increase the game's replay value immensely. However, Factor 5 has another trick up their sleeves and have gone the extra mile to include the entire Rogue Leader game in its multiplayer mode. This mode allows you to replay the second game's missions co-operatively with a friend. This sounds really cool and should be an amazing addition to the game. While it doesn't look like there will be ant major additions or changes to these levels, playing with another gamer should be enough to make them feel fresh. Between these new multiplayer modes and the new ground-based missions, Rebel Strike should definitely mark a significant evolution for the series. It won't be all action, because the cinematic feel of the previous Rouge Squadron titles will be expanded with even more cut-scenes and dialogue, giving the game an even richer, more dynamic feel. Visually, the game is already looks quite stunning. Based on our E3 experience, the silky smooth frame rates and evocative visuals players have come to expect from the series are very prominent. Rebel Strike should further improve on the high standards set by the original with amazingly detailed environments, realistic vehicle renders plus the usual outstanding special effects such as massive explosions that should make for a stunningly movie-like experience. Rebel Strike's production values should be further enhanced by John Williams' classic score and extensive voice over acting that will make the game sound as good as it looks. From a technical standpoint, Rebel Strike will maximize the experience on high-end systems by supporting both HDTV and Dolby Surround. LucasArts and Factor 5 deserve a lot of credit for not resting on their laurels, and instead creating a sequel that pushes the series forward in new directions. With eye-bleeding graphics that are as good, if not better than the original, players should expect a polished incredibly exciting title that lives up to the legend and standards of the Star Wars name. Adding ground-based missions and multiplayer modes to what was already an amazingly good space shooting title should make for an even more cinematic experience that should please die hard film fans and gamers alike. The different mission types will make for a more varied and interesting title. These different elements seem to be falling together perfectly and the highly anticipated Rebel Strike is definitely looking like one of this year's most exciting Gamecube titles.